"The Masters made me realize what golf means to me. 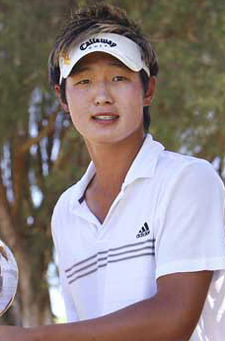 From now on, I will try to take golfing to a higher level as a professional," says Danny Lee, the 19-year-old Korean New Zealander who became the youngest winner of the U.S. Amateur title last year and the Johnnie Walker Classic in Perth in February. Lee made it official that he is turning professional on Wednesday. USA Today and AP were among the international media turning their focus on Lee. Because of his talent and potential, Lee is often referred to as the next Tiger Woods. He amassed a huge amount of money from a number of sponsorship deals matching those of the top-ranked PGA players. He has inked his main sponsorship deal with Callaway, and sub-sponsorships with MasterCard, Rolex and Kolon Elord. "I was a bit disappointed about being cut off at the Masters by going 11-over, but I went through a lot of emotions when playing golf in front of over 60,000 people," said Lee. Meeting legendary figures like South Africa's Gary Player on the field, he said, helped him firm his conviction about golf. Lee makes his professional debut at the Zurich Classic of New Orleans on April 23.